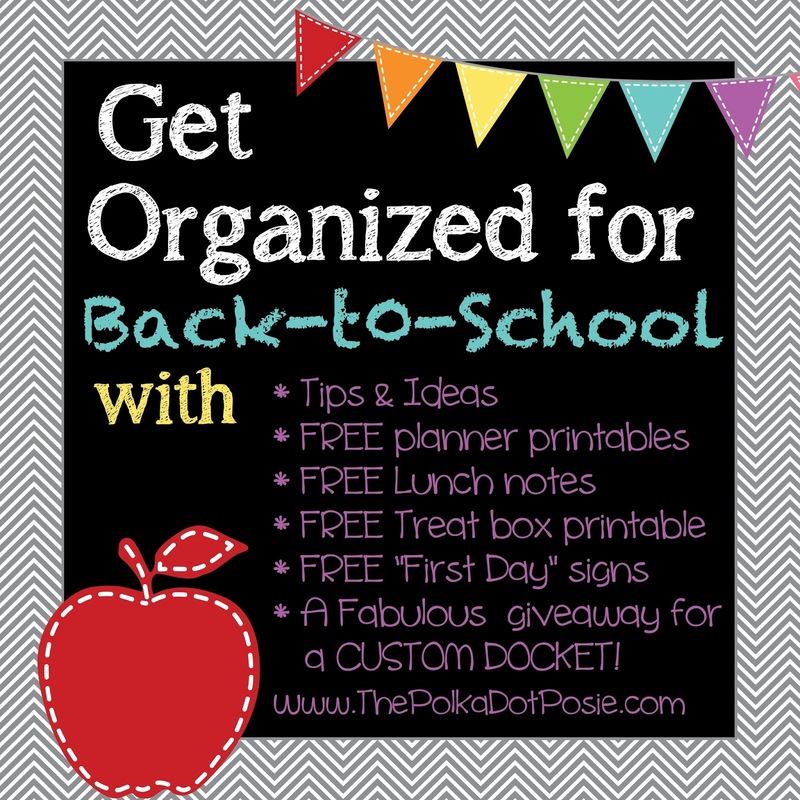 The Polka Dot Posie: Get Organized for Back-to-School! Judging by the traffic in our shop the last few weeks, it's obvious that teachers, parents and students are all eager to start planning for the school year. If you don't already have a planner started for the 2014 - 2015 school year, we have several fun options available. In the last two weeks, we've launched our Teacher & Homeschool Planners, our new Student Planners and for those of you that want a more basic home planner to use for multi-tasking, our Signature Undated Planner set is incredibly flexible (and cost effective because you can use it year after year). 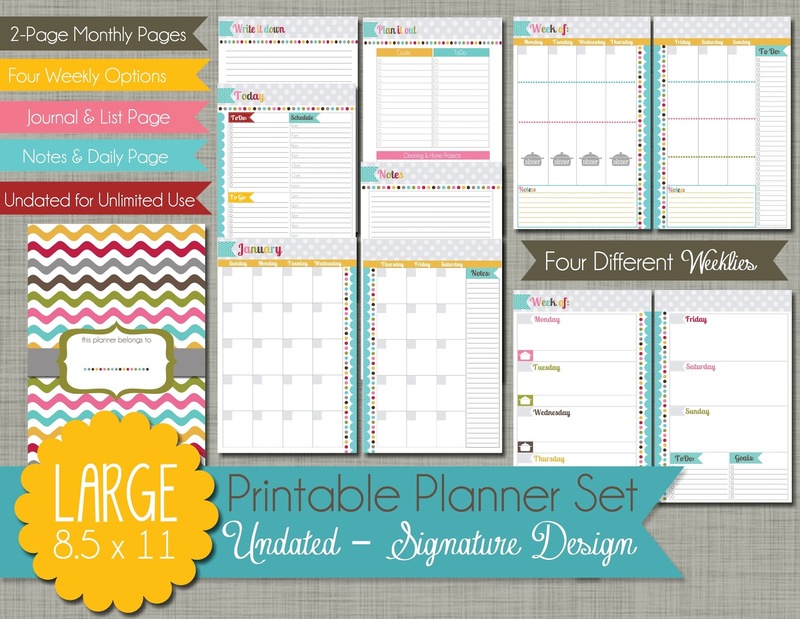 This set is also to great to use for a Home Management Binder or Household Planner. 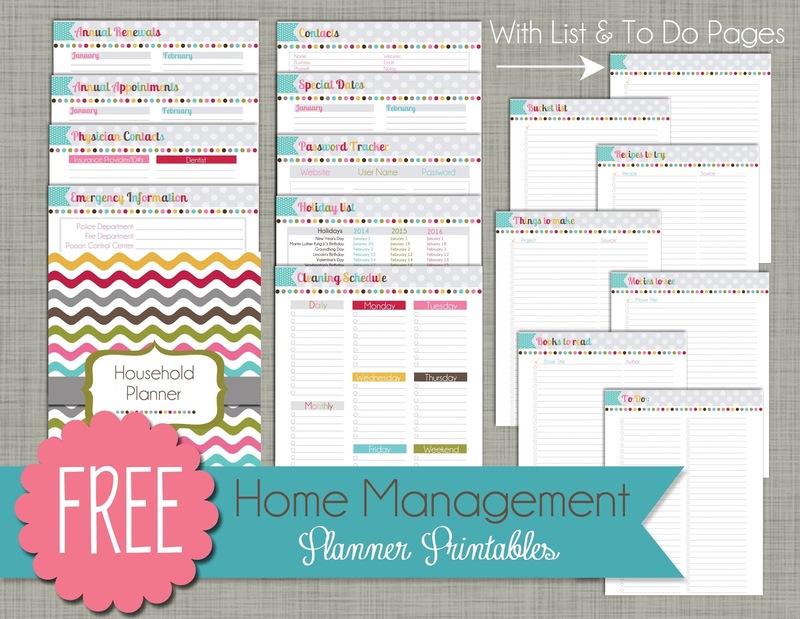 We have recently updated all of our FREE Home Management Planner Printables and extras to coordinate with this set! Blank List page that you can use for whatever you want! A lot of people ask what the difference is between a daily planner and a Home Management or Household planner, and this answer can be different for everyone. For me, the difference is that my daily planner is something only I look at. It's where I keep my schedule, notes and other important info. I have a love/hate relationship with the word "Routine." By the end of the school year, I am so ready for carefree days and blank spaces on the calendar. But by the end of summer, I am craving it. This summer, all of our routines went out the window, including my cleaning schedule. One of the most important lessons that Martha Stewart ever taught me was that if everything in your home has a space, then everything can easily find it's way back to that space before the day is over. If your closets are so packed you can't squeeze in another folded pair of jeans, or if your kid's toy bins have no rhyme or reason, the likelihood of either of you putting things back where they go is slim. * Bedroom closets and hall closet. I am also going to try and nail down a new weekly cleaning schedule. 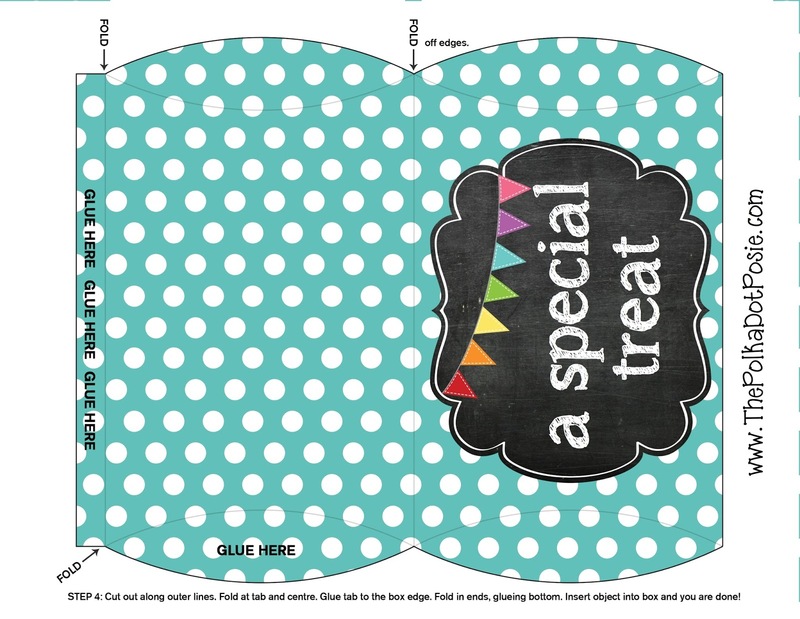 I have updated the one that is part of our FREE printables and I am excited to start using it! And speaking of cleaning schedules and household responsibilities, make sure you don't forget about the kids!! 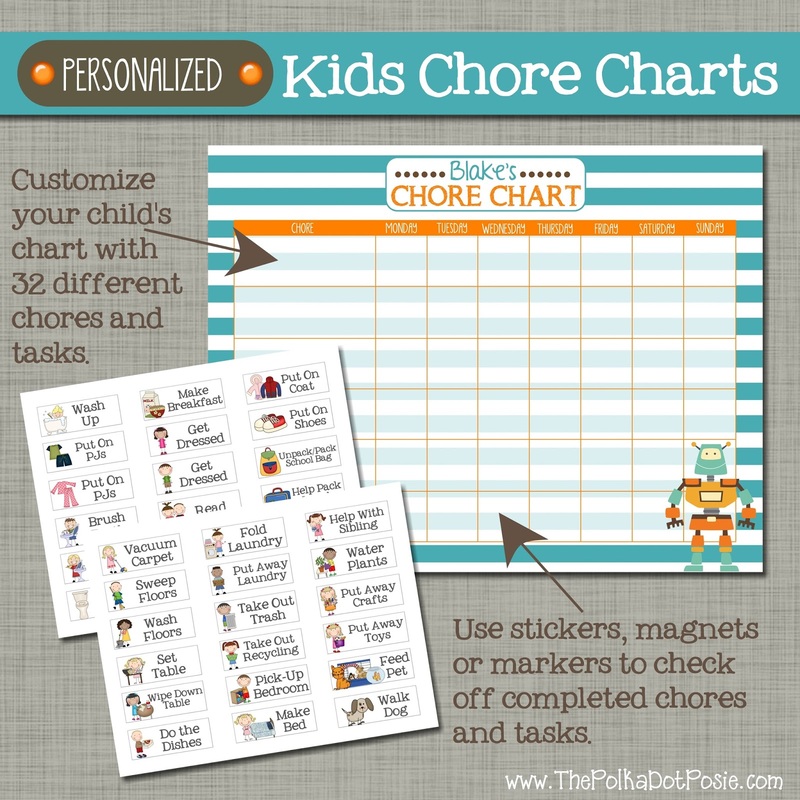 Although mine both love their chore charts, we have really let them slide this summer. This week we are going to assign our new chores for the school year and fill up our "reward" bin. Right now, we have several cute designs in our shop and will hopefully be adding more this fall! Check them all out HERE. There was a time when I was SO good at meal planning. That time was definitely not this summer. Ha! But this school year is going to be twice as busy as last year so I MUST get back on my game. Luckily, most of our planners come with a meal planning option built right into your weekly schedule. We also have some fun daily and weekly dockets that also have space for planning dinners throughout the week. 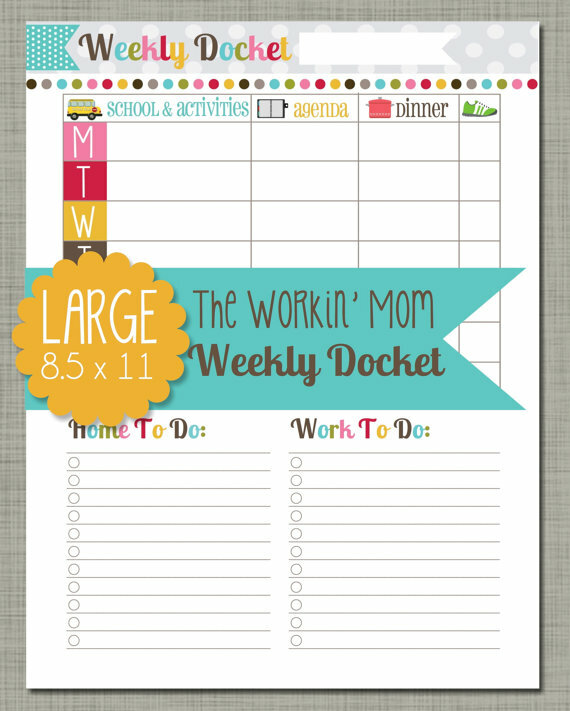 Perhaps my favorite docket for back-to-school is the Workin' Mom Daily Docket. But please don't let the name mislead you. This docket isn't just for Moms who work outside the home. This docket is for ALL moms who have work to do during the day. Many stay-at-home-moms like myself have small direct sales businesses, online shops, blogs and more to keep track of, so this page is a great way to balance all that on one page. But one thing that these experienced moms have told me is that cute little lunch notes go a long way. I used to LOVE when my mom would slip little notes into my lunches as a kid, especially when I was younger and missing her at school :) There are a million options for free lunch notes online, but I went ahead and made a cute set anyway. My goal for this school year is to share a free sheet of lunch notes every month. But to get you all started for the school year, you can download this set HERE. 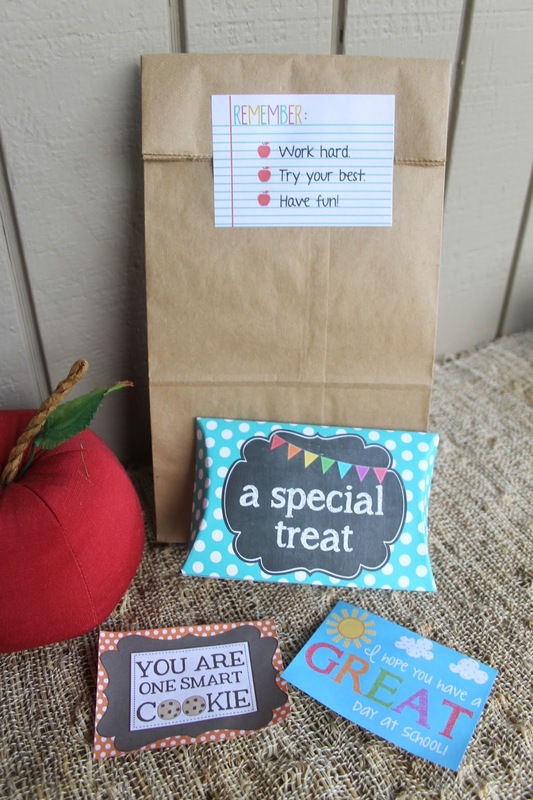 These lunch notes can either be printed on card stock and slipped into your child's lunch tote, or you can print them on Full Sheet labels, cut them out and stick them to our child's lunch bag. My daughter has had her "First Day of School" outfit planned for a while, but my son will leave that part to me :) I get so excited planning the kids outfits for school and I love seeing their fresh new backpacks hanging by the door, ready to go. I know "First Day" and "Last Day" pictures are all the rage now, but having these memories of my kids each year is priceless! But don't wait till the last minute (like I did) to print your signs and get them ready for pictures. Nothing like realizing your printer is out of ink 20 minutes before leaving the house on the first day. YIKES! 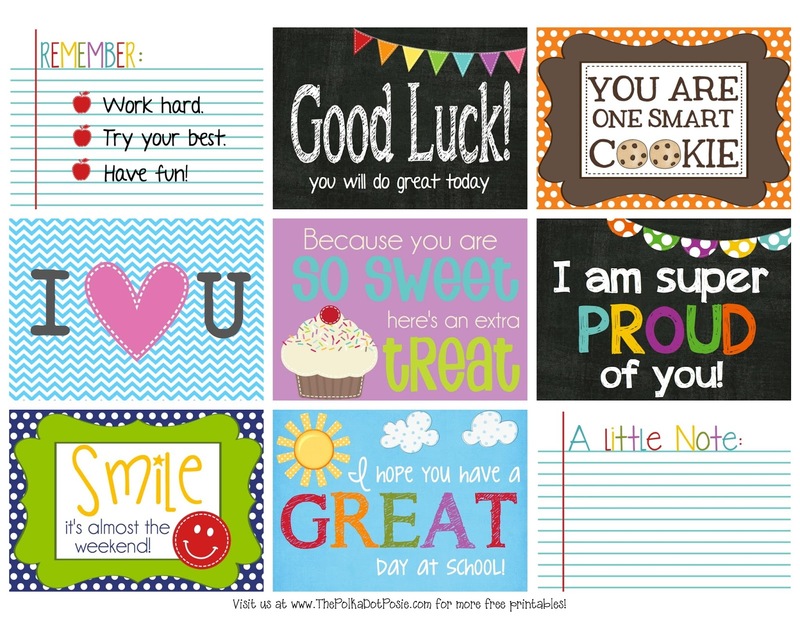 So now you can plan ahead and download our new Chalkboard First Day of School signs!! Now…in addition to all the great FREEBIES we are sharing in this post, I also want to do another GIVEAWAY!!!! I get a LOT of custom requests in my shop, but perhaps the most common request is for customized daily and weekly dockets. Some people like posting them on their fridge or family bulletin board, while others use them in their planners and home management binders. Many people like to customize the colors or the headings of the different sections to meet their needs. And since I understand how valuable these one-page dockets can be…I thought this would be a PERFECT back-to-school giveaway!! You will have one week to enter and we will announce all winners on Monday, August 11th! We hope that this will get all of you excited for back to school and give you the motivation you need to say goodbye to summer and hello to another fabulous school year! You know i'm in!!! I love your pages! I would use these to organize family and work life. This is a great giveaway! Super excited about the possibilities! I came across your printables a couple months ago and have loved all of them, thank you so much for this fun giveaway! I totally agree with craving routine by the end of the summer! It's been a bit different since this was my first summer working full time with kids but I'm so ready for the crazy back to school schedule! Love love the lunch notes!! All so super cute! 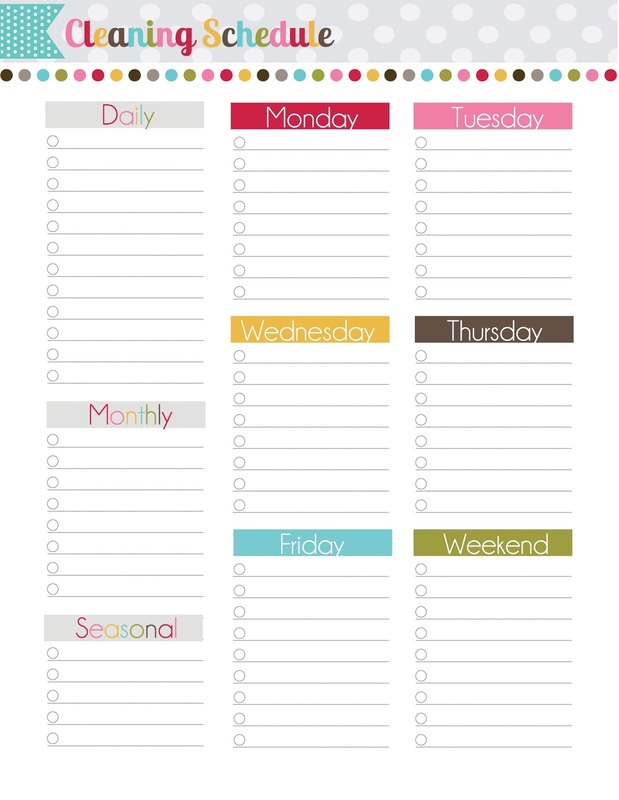 I will love using the Daily Docket to keep my stay at home husband organized and on task while I'm out slaving away at work! LOVE you for this! I would use my docket in my new filo I saved for and finally got last week as I travel back and forth to my full time bank job and keep my 5 year old and wonderful husband organized an on schedule. I love anything you make Jen! I would use this in my planner this year! Thank you for posting all these printables! I can't believe how quickly the summer has gone. I am in LOVE with the planner pages that I recently bought from your shop. Thanks for the free printables that go well with everything else. It's so much fun to customize my planner to my needs. These are super adorable~ and thanks to the lady on Discbound Divas who pointed me in this direction! And I'd use the docket in our family planner arc notebook. Would love to keep my families schedule organized with this! I love the colors! So cheerful! I already have a daily docket designed by you so it's only fitting to use a weekly docket for the family's schedule. Thanks Jen! The roots of music sampling predate the 1980s, when gucci replica the hip hop scene first emerged. Some point to the fact that jazz musicians have always borrowed each other's riffs. But the sampling of recorded music evolved out of sound collage that started decades earlier. louis vuitton replica Early sound pioneers experimented with the very definition of music. Pierre Schaeffer and Pierre Henry, for example, started their own movement of musique concrète when they began collaborating back in the 1940s. Before tape recorders http://www.australiapackages.co.uk were even around, they used disc cutters to push the boundaries of music by making unique sound collages. And by "sound," we mean more than just replica wathces instruments. They also used the sounds of trains and mechanical noises. Soon, other pioneers such as Karlheinz Stockhausen were influenced by Shaeffer. And later, even the Beatles dabbled in musique concrète with their experimental track "Revolution 9" from "The White Album."